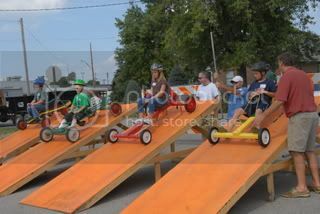 I am gonna try and ask and get info for all cub scout packs holding a cubmobile race in Illinois for 2009. To post or update there info. The sooner You check into it, the better chance of getting the plans and rules. You want to pass there inspections. There is not set of rules & plans that most packs go by. However I would also like to take the lead, As i have made a attempt to contact many of them. I would like to talk to the packs about many things. To help the sport grow and be safe. there is Red hawk district, they race in City parking lot F on 8th Street in Charleston IL. Held at LeROY	OAKS	Forest	Preserve. Other locations where cubmobile races are held. I have heard of even two to three more packs starting up a cubmobile race in 2009 !! There is a soap box derby race, that I believe is more or less a cubmobile race, However the race is done by age brackets. It also apears girls can do it also. Our classes in Soapbox are determined on race day by ages. Entrants can be Kindergarten through 8th grade but each year we may have more or less in some age groups. This year we had four classes: 5 & 6 year olds in one class; 7 & 8; 9 & 10 and 11 and up. Soapbox is always the Saturday before the Pumpkin Festival so in 2009 it will be on Sept. 12. Wow- they have 4 ramps !!! I am hoping they will send / post some more pictures for all of you.